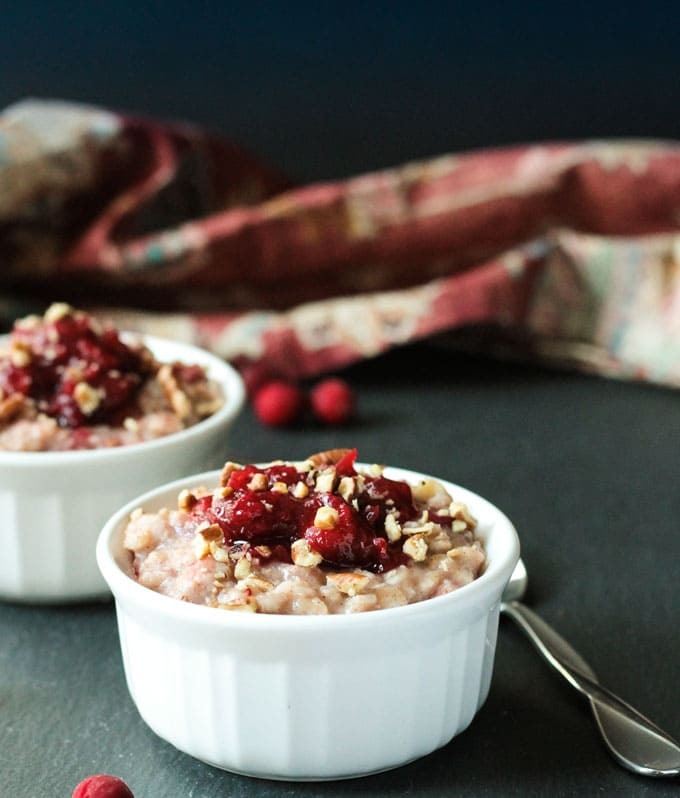 Cranberry Oatmeal – this super easy, creamy, dairy free oatmeal, makes use of leftover cranberry sauce from the holidays. I have an overabundance of cranberry sauce in my fridge at the moment. It’s delicious, but one can only eat so much before getting bored. Therefore, I’m using up my cranberry sauce by transforming into other dishes. 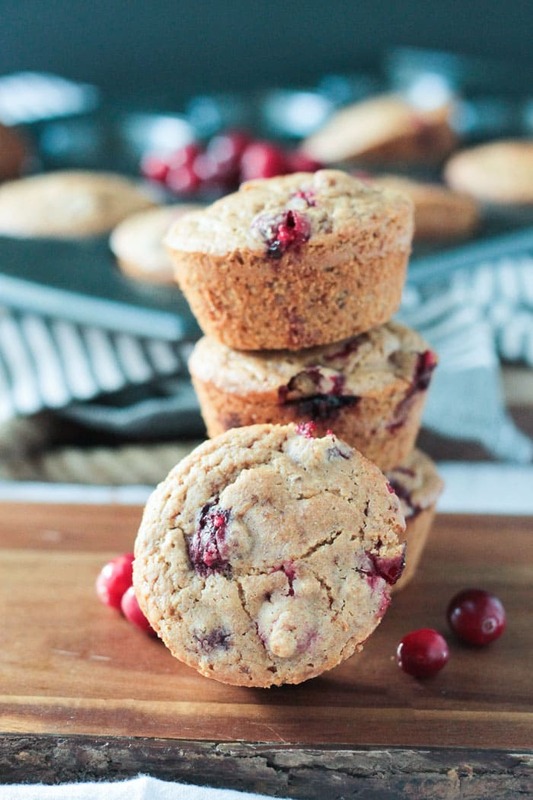 Prepare yourselves for quite a few new cranberry recipes coming your way. 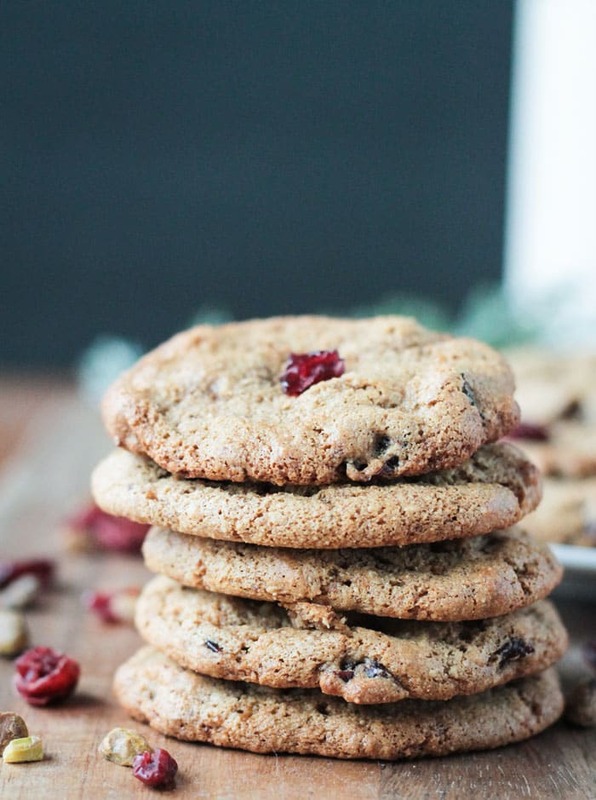 First up, is Creamy Cranberry Oatmeal! It never fails. Every holiday, get together, birthday party, etc., I always forget to put out one of the dishes I made. Thanksgiving 2014 was no exception. We hosted our neighborhood Annual Thanksgiving Eve Potluck this year (such a fun event…I LOVE my neighbors!!) and, sure enough, just as the last guests left, I opened my fridge and there it was staring back at me….cranberry sauce. My Maple Cinnamon Cranberry Pear Sauce to be exact. I made a double batch because we had just over 35 people. So, now I have a sooo much cranberry sauce and only 5 of us (4 really since hubby isn’t a fan of cranberries) to eat it. Oatmeal is a staple at our house. It’s so easy to customize with different fresh fruits, fruit purees, dried fruits, nut butters, chopped nuts, seeds, sweeteners, spices, etc. I almost always start out my oatmeal the same way to make it super creamy and sweet with NO sugar. You can read how I do this in detail in my Customizable Healthy Oatmeal post. 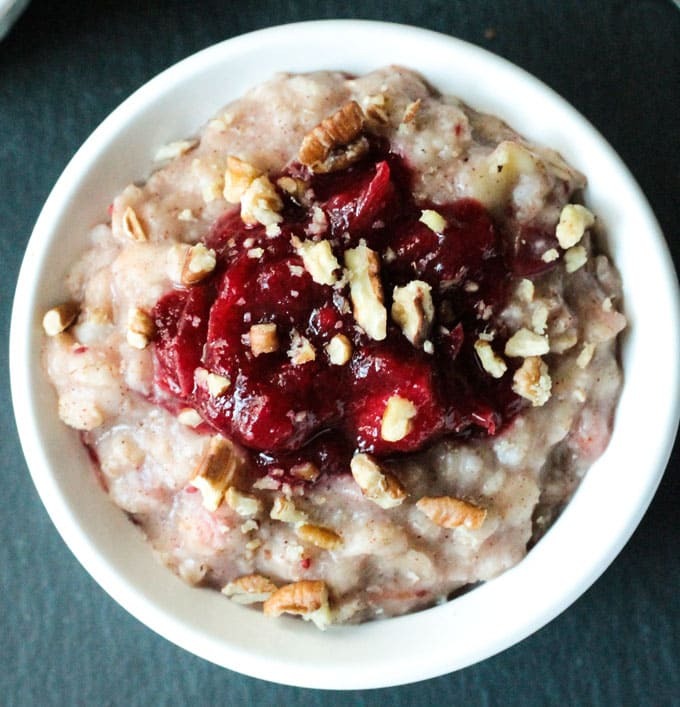 This cranberry oatmeal started out the same way too. 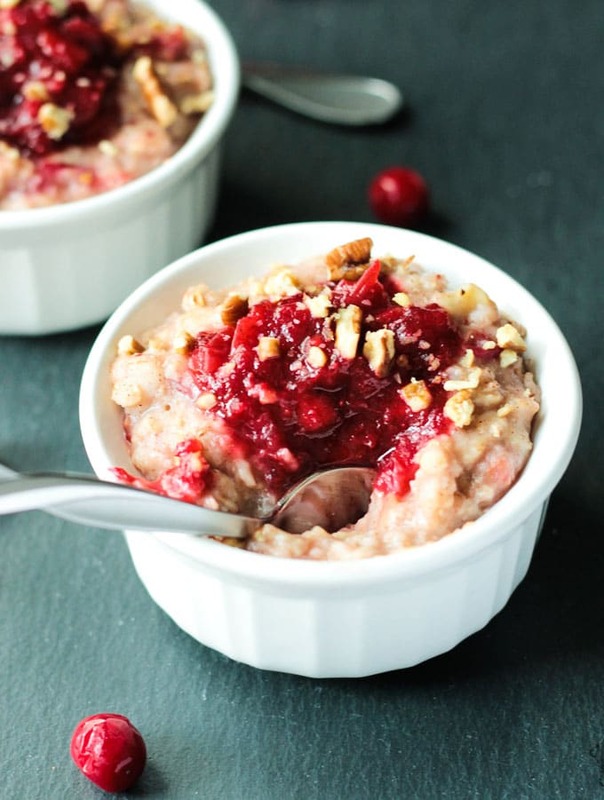 I love the tangy cranberry sauce combined with the sweet creamy oatmeal…it’s so good! This recipe is really simple and quick. Feel free to add some chopped pecans or walnuts before serving as well. 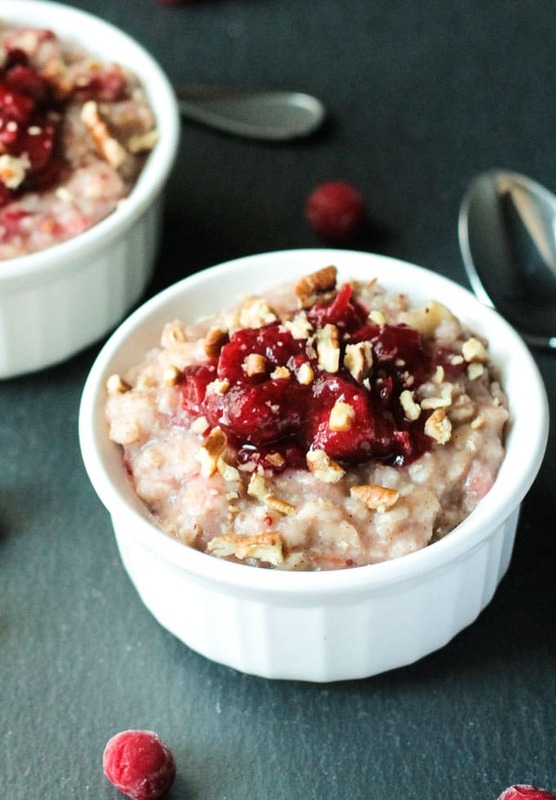 I hope you love this Creamy Cranberry Oatmeal as much as we do. If you try it, please come back and leave me a comment below with your feedback and star rating. 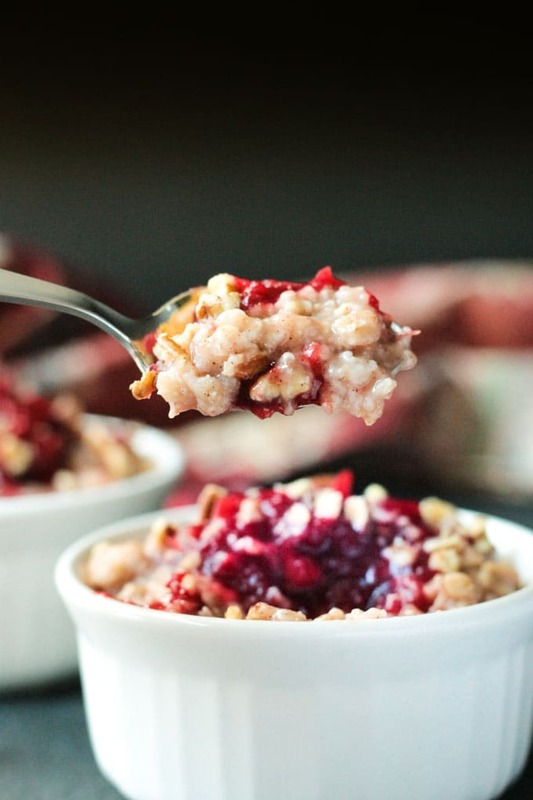 Super easy Cranberry Oatmeal that makes use of leftover cranberry sauce from the holidays. Add water and smashed banana to pot. Whisk until the banana is mostly incorporated into the water. Add oats and cinnamon and stir. Bring mixture to boiling and then reduce to medium-low for about 5 minutes until oats are creamy. Add cranberry sauce and stir to combine. Continue cooking for another minute or two just to heat through. 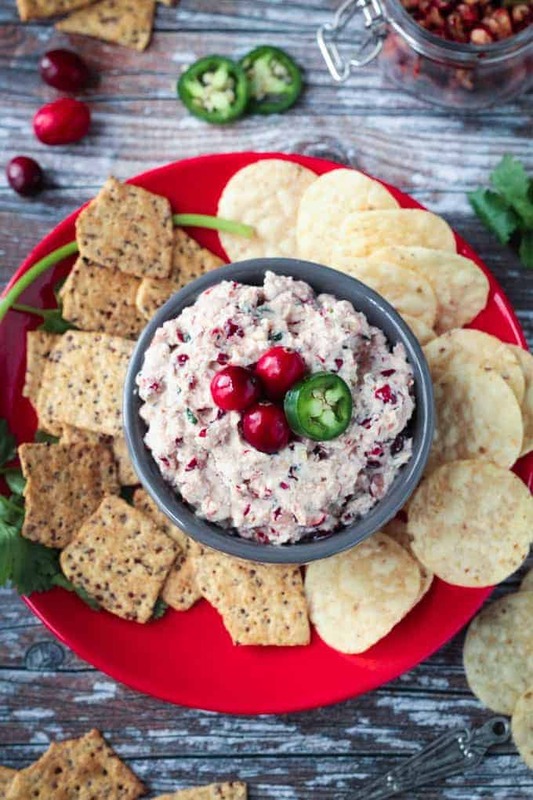 ~I like to add a dollop of cold cranberry sauce on top of each individual serving for a little bit of cold/hot in each bite. ~Feel free to add some chopped nuts to the top as well for a little crunch. Thank you, Natalie! I recently took new pics, so I’ve been promoting it again. It really is a deliciously tart and sweet. A great way to start the day!